This mod changes the Stormcloak and Imperial faction\'s relationships with the player when they wear the opposing factions armour. If the player wears Stormcloak armour then the Imperial soliders and guard will attack, if the player wears Imperial armour the Stormcloak soldiers will attack as well. If you wear both then everybody will hate you. Update to version 1.3 - Wearing Forsworn or Thalmor armour now makes you allied with that faction. In this build you are not added as an ally to the Hagraven faction (who are commonly with Forsworn) so they will still attack you. You can do some funny stuff as their allies. Update to version 1.2 - Added penitus oculatus armour. Added configuration menu so player can decide what armours cause agression. Update to version 1.1 - Faction change now only applies when wearing the body of an armour set, not each piece. Added Forsworn, Talos and Thalmor factions. 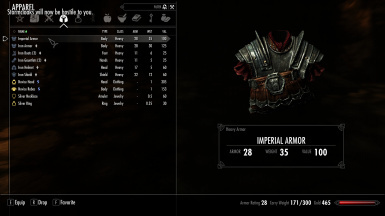 This mod changes the Stormcloak and Imperial faction's relationships with the player when they wear the opposing factions armour. If the player wears Stormcloak armour then the Imperial soliders and guard will attack, if the player wears Imperial armour the Stormcloak soldiers will attack as well. If you wear both then everybody will hate you. I made this mod because I felt it was a bit strange that when you're walking around in Imperial armour none of the Stormcloak patrols will attack you. With this mod they will attack you on sight. When you take the armour off you may need to wait a little while before the hostilities end. This mod does not require and DLC. There are no currently known compatibility issues, if you have any specific concerns please tell me and I will investigate. To install this mod, download the .rar and use the nexus mod manager. Or you can drop the .esp and .bsa files into your Data directory if you don't use the mod manager. Created by mackam08 aka IrksomeBadger. Notes: Wearing Forsworn or Thalmor armour now makes you allied with that faction. In this build you are not added as an ally to the Hagraven faction (who are commonly with Forsworn) so they will still attack you. You can do some funny stuff as their allies. Notes: Added penitus oculatus armour. Added configuration menu so player can decide what armours cause agression, config menu requires MCM and SkyUI. Notes: Faction change now only applies when wearing the body of an armour set, not each piece. Added Forsworn, Talos and Thalmor factions. Notes: Changing armour will now cause the opposing factions soldiers and guards to attack the player.